SAN FRANCISCO, California, April 18, 2016 (ENS) – “If we seek to achieve environmental justice we must first empower citizen participation and protect our natural resources,” said Luis Jorge Rivera Herrera, the 2016 Goldman Environmental Prize Winner for Islands and Island Nations. Rivera helped lead a successful campaign to establish a nature reserve in Puerto Rico’s Northeast Ecological Corridor, an important nesting ground for the endangered leatherback sea turtle, and protect the island’s natural heritage from harmful development. 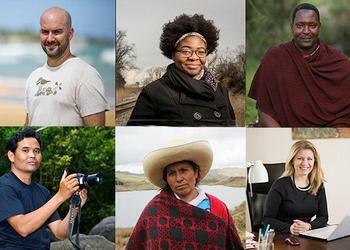 The Goldman Environmental Prize honors grassroots environmental heroes from the world’s six inhabited continental regions: Africa, Asia, Europe, Islands & Island Nations, North America, and South & Central America. Carrying a financial award of $175,000 to pursue their vision of a renewed and protected environment. the Prize recognizes individuals for sustained and significant efforts to protect and enhance the natural environment, often at great personal risk. The Goldman Prize views “grassroots” leaders as those involved in local efforts, where positive change is created through community or citizen participation in the issues that affect them. Through recognizing these individual leaders, the Prize seeks to inspire other ordinary people to take extraordinary actions to protect the natural world. Destiny Watford, United States: In a community whose environmental rights had long been sidelined to make room for heavy industry, Watford inspired residents of the Curtis Bay area in Baltimore, Maryland to defeat plans to build the nation’s largest trash-burning incinerator less than a mile away from her high school. As a member of the nonprofit Free Your Voice, a student led human rights group based out of her old high school, the 20-year-old college student said, “To have an incinerator that would be burning 4,000 tons of trash per day, emitting 240 pounds of mercury and 1,000 pounds of lead into the air every year, less than a mile from where I play with my baby nephew on the playground, where my little brother goes to school, and where so many of my family members work, is a perfect example of failed development. Zuzana Caputová, Pezinok, Slovakia: A public interest lawyer and mother of two, Caputová spearheaded a successful campaign that shut down a toxic waste dump that was poisoning the land, air and water in her community. Working through the NGO Via Iuris – Center for public advocacy – she helped set a precedent for public participation in post-communist Slovakia. Leng Ouch, Cambodia: In one of the most dangerous countries in the world for environmental activists, Leng Ouch went undercover to document illegal logging in Cambodia and exposed the corruption robbing rural communities of their land. This caused the government to cancel large land concessions. Luis Jorge Rivera Herrera, Puerto Rico: In the 16-year battle to establish a nature reserve in Puerto Rico’s Northeast Ecological Corridor, a crucial nesting ground for the endangered leatherback sea turtle, Rivera helped lead a successful campaign to challenge government corruption and advocate for the public’s right to demand protection for the environment. Máxima Acuña, Peru: A subsistence farmer in Peru’s northern highlands, Acuña stood up for her right to peacefully live off her own land in the northern Peruvian highlands of Cajamarca, where almost half of the region’s land has been given away in mining concessions. Her property was sought by Newmont and Buenaventura Mining to develop the Conga gold and copper mine, which called for draining four nearby lakes. One of these, known as Laguna Azul, would be turned into a waste storage pit, threatening the headwaters of five watersheds and Cajamarca’s páramo ecosystem, a high-altitude, biologically diverse wetland. At the award ceremony tonight in San Francisco, Acuña sang her own song, telling the story of her resistance to the second-largest gold mining companies in the world. There was a tribute to Honduran Berta Cáceres following her assassination on March 3, 2016. 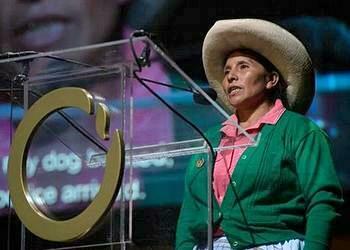 Cáceres was co-founder and coordinator of the Council of Popular and Indigenous Organizations of Honduras. Three indigenous women poets offered spoken word poetry dedicated to her life and legacy. Edward Loure, Tanzania: Loure led a grassroots organization that pioneered an approach that gives land titles to indigenous communities, instead of individuals, in northern Tanzania, ensuring the environmental stewardship of more than 200,000 acres of land for future generations. Goldman Environmental Prize recipients focus on protecting endangered ecosystems and species, combating destructive development projects, promoting sustainability, influencing environmental policies and striving for environmental justice. Prize recipients are ordinary citizens who choose to take great personal risks to safeguard the environment and their communities. Don’t miss watching these activists receive their awards and join us as we stream live on April 18! American philanthropist Richard N. Goldman (April 16, 1920 – November 29, 2010) co-founded the Goldman Environmental Prize in 1990 with his wife, Rhoda Goldman (1924 – February 17, 1996). It is awarded annually on or near his birthdate.